Walthamstow Marshes are one of the last expanses �of semi-natural marshland left in London. Extending to 88 acres, they are unique in the Lower Lea Valley as all the other marshes have, at one time or another, been drained, used for gravel extraction,�used as dumps (with levels as a consequence raised above the floodplain), or redeveloped completely. Walthamstow Marshes is a Site of Special Scientific Interest (SSSI), designated in 1985.�According to Natural England, the Marshes were designated because they form “one of the last remaining examples of semi-natural wetland in Greater London".�Read more�(opens an external link to a PDF document). A comprehensive survey of the Marshes was undertaken in 1979 and updated in 1981: 'Walthamstow Marshes: Our Countryside under Threat'.�Read more�(opens an external link to a PDF document). In all, 350 plant species have been recorded in the Marshes including�Creeping Marshwort, one of Britain's rarest plants. The wetter parts have a beautiful mixed-fen vegetation with large expanses of Sedge,�Reed Sweet Grass�and Reed Grass that grows to 5 and 6 feet tall.�Reed Mace ('bulrush') is found in the Coppermill stream and in drainage channels beside the Sandy Path; Yellow Grass in other channels and streams. Tufted Hair Grass, an indicator of ancient grassland, can be found alongside Marsh Horsetails and Comfrey.�The survey of 1981 recorded ten new plants. Seventeen species of butterfly breed on the Marshes, including an important colony of 'Essex Kippers'. There are dragonflies, damselflies and crickets. Moths found on Walthamstow Marsh include Lime Hawk, Swallow Prominent and Marbled Beauty. Sedge Warblers, Reed Warblers, Reed Buntings and Goldfinches; Greenfinches, Stonechats, Skylarks, Herons, Kestrel and Snipe sweep over the Marshes. There are voles, shrews, harvest mice with frogs in spring and frogspawn in the ditches and reedbeds. From at least 1604, the Walthamstow level fell under the jurisdiction of the Havering and Dagenham Commissioners of Sewers.�The Commissioners' main concern was to maintain the drainage system of the level, which required:�dragging and scouring ditches and sewers; cutting back willows; maintaining the banks of the Fleet or mill-stream; and preventing the occupant of the mill (The Copppermill) from penning up so much water that it overflowed the banks of the stream. The Court of Commissioners also supervised footbridges laid across the common sewers (rivers, streams and ditches). A marsh bailiff and a treasurer were appointed for the level, responsible to the Commissioners, and a marsh jury to present defects. The bailiff saw that the orders of the Court of Sewers were carried out. Walthamstow Marshes are known as Lammas Lands where, by ancient custom, grass was grown in hay-meadows in early summer and �animals turned out onto the mown fields after the hay harvest. Following the Norman Conquest of 1066, the land was often divided into strips to grow grass and make hay, which could be brought and sold, but the common right of pasturage was left intact. This season of free grazing rights commenced on or about Lammas day, usually around 1st August, through to Lady Day around 25th March. The practice of the Lammas grazing system is first recorded in �Walthamstow in the manorial records of the Manor of Walthamstow Toni (or High Hall).�The Manorial Courts supervised the lammas lands and cattle pounds and from 1759 appointed a 'Marsh Hayward' (or Marsh Bailiff, or Haywarden). Until 1752 (or 1873? ), residents of Walthamstow and Leyton Parishes could graze their cattle on all of the �Walthamstow and Leyton Marshes between Lammas Day and Lady Day. So called inter-commoning came to an end when the dates for grazing to commence and cease began to be disputed, and the views of the parishes diverged. A fence was erected and a line of black poplars planted to mark the boundary. Map survey evidence indicates the narrow grazing strips continued to be maintained on Walthamstow Marshes into the nineteenth century, marked by iron posts. The Lammas system, �which had endured for centuries, �survived until 1934, �when grazing rights for the remaining 100 acres were extinguished and the Marshes recognised �as public open space under�Walthamstow Corporation Act of that year. The Commissioners' responsibilities increased from the mid-nineteenth century with the construction of railways across the Marshes and with developments by the�East London Waterworks Company, both of which required a series of alterations to the elaborate marsh drainage system, including the diversion of the Shortlands/ Blackmarsh Sewer�and the gradual extinguishment of lammas grazing rights. The Walthamstow level extended to some 809 acres in 1747. Little changed over the next 100 years, with 144 acres remaining open in 1850.�But by the end of the nineteenth century, Walthamstow Marshes had been dissected and massively diminished in area by a Victorian infrastructure building boom. This pattern of severance, fragmentation and encroachment was to continue in the twentieth century. In 1909, aviator A.V. Roe assembled his ‘Yellow Terror’�tri-plane in the arches beneath �Clapton railway viaduct and then flew an historic 900 feet across Walthamstow Marsh - the first Englishman to design, build and fly an all-British aeroplane. A plaque on the railway arches commemorates A.V. 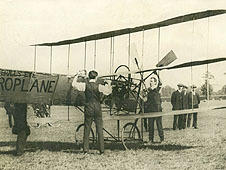 Roe (1877-1958) and the first all-British powered flight in 1909. In 1934, under the Land Drainage Act 1930, the Lee Conservancy Catchment Board took over responsibility for the Walthamstow Marshes from the Commissioners of Sewers. A flood relief channel was planned to cut across the Marshes in 1938, but postponed at the outbreak of war. Plans for a�River�Lea Flood Relief Channel�were revived after catastrophic flooding in 1947 and again in 1948. Construction began in 1950. The Channel resulted in the final severance of the Shortlands/ Blackmarsh Sewer,�which once meandered across the Marshes. A network of anti-aircraft trenches was dug across the open marshland in 1940�as part of anti-invasion measures. These were backfilled in 1949, but the lines of the trenches are still visible. This is especially so in winter when raised water levels reveal the trench lines. A V2 rocket exploded on the Marsh in 1945, creating a large crater. This is known today as Bomb Crater Pond. Early plans for the route of the Victoria Line included an option to cross Walthamstow Marshes at surface level and to build a depot there. The plan was abandoned. The Greater London Council refused planning permission on 4th february 1980.�The Lee Valley Regional Park Authority appealed to the Department of the Environment in August 1980�with a public enquiry held in the summer of 1981. This�led to the designation of the Marshes as a SSSI in 1985 and as a Nature Reserve in 1986, following the Park Plan Review.